Photo: Kelly Taub/BFA. Courtesy Dallas Art Fair. The Dallas Art Fair is pleased to announce that the ninth edition of the fair will take place from April 6 through April 9 at the Fashion Industry Gallery (F.I.G.). The 2017 Fair brings several exciting additions to its exhibitor list including world-renowned galleries Gagosian Gallery, Lehmann Maupin, Simon Lee Gallery, Skarstedt Gallery, and Shane Campbell Gallery. This installment will reveal over 90 galleries from 16 different countries. More than 30 of these participants are new to the fair, with 70% returning. 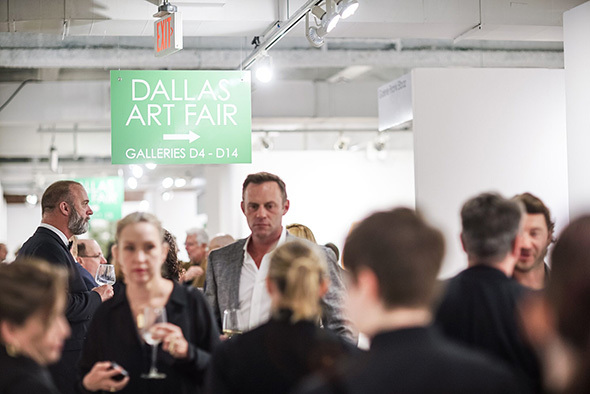 Proceeds from ticket sales to the Dallas Art Fair’s Opening Gala will be donated to the Dallas Museum of Art, the Dallas Contemporary and the Nasher Sculpture Center. “We look forward to collaborating with our major institutions to present our patrons and visitors with an incredible series of arts programming throughout the week of the Fair,” says Sughrue. In addition, the fair will feature the second year of its Dallas Art Fair Foundation Acquisition Program in collaboration with the Dallas Museum of Art, with funding doubling to 100,000 USD. Hoffman Family Senior Curator of Contemporary Art Gavin Delahunty will select works directly from participating galleries to be purchased for the Dallas Museum of Art’s permanent collection.